With the rise in fuel costs it’s important we’re making a conscious decision to save energy and reduce our carbon footprints. With the installation of thermally efficient windows and doors from Inspire, you can reduce your costs for heating bills almost instantly after installation. Energy efficient windows have a Window Energy Rating of ‘C’ or higher. Our windows come with a BFRC (British Fenestration Rating Council) energy rating which is the government scheme set up to improve the energy efficiency of double glazing, buildings and home improvements. For a completely efficient home always opt for ‘A’ rated but a minimum of ‘C’ is approved by the BFRC standards. They have developed an energy rating system that measures the energy performance of residential windows so you can be clear when purchasing. The Energy Saving Trust is also a recognised energy efficiency board. They approve windows, doors and conservatories that have an energy rating of ‘B’ or above, giving you confidence in your choice of double glazing. Partnered with Planitherm, the glass we install comes from one of the best energy efficient glass manufacturers in Europe. A window with energy efficient glass is highly important. Each window should contain low emissive (low-e) glass which is coated in a cleverly designed reflective material that allows heat to return back into the room rather than continue to escape out the window. If you opt for low-e glass you will be benefiting from a glass that is three times more energy efficient that standard double glazing. In order for your new windows to be fully energy efficient they must also contain frames that are filled with gas. These harmless gasses such as argon, xenon or krypton make your windows and doors more energy efficient. Argon is the standard. Choose window frames that have ‘warm edged spaces’ as these re the most energy efficient on the market. At Inspire, all of our windows and doors are made with these warm edged spaces as standard making them an excellent choice when creating an energy efficient home. Energy efficient windows allow you to contribute towards a greener environment. Using less fuel will result in less CO2 which contributes towards global warming. Energy efficient windows will reduce heat loss, eliminating draughts and cold spots. Energy efficient windows will also insulate your home against unwanted outside noise. The energy efficiency of your home is important, which is why making sure any new home improvements are installed correctly. It is also an excellent way of reducing your monthly outgoings on fuel bills. Check your windows for any draughts or cold spots which can be upping your heating bills without realising. 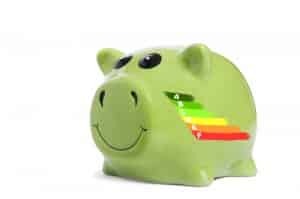 Have a look at some energy saving tips for more ways on saving energy and money.